Representative Lamar Smith, the Chairman of the House Committee on Science, Space, and Technology, has been the subject of a number of CauseScience posts. The House Committee continues spreading misinformation and seemingly abusing its power, now to bully NOAA climate scientists – Scicheck has summarized the anti-science misinformation and bullying on factcheck.org (which they have also done in the past). Rep. Lamar Smith, chairman of the House Committee on Science, Space, and Technology, has made several inaccurate or misleading claims about climate science in an ongoing battle with the National Oceanic and Atmospheric Administration. In fact, there has been substantial warming over the past two decades, and NOAA’s adjustments to its data are well-studied, publicly available, peer-reviewed methods for obtaining the best possible temperature readings. I’m sure that Rep. Lamar Smith and the House Committee are more qualified to judge a paper in SCIENCE than the peer-reviewers who are also climate scientists….. NOT! For a scary look at the House Committee on Science, Space, and Technology, check out their twitter feed. Wow… just wow. Join scientists and others in supporting NOAA climate scientists by tweeting #ISupportNOAA – @HouseScience! 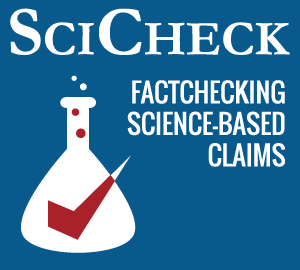 SciCheck (part of FactCheck.org) has fact-checked a recent Wall Street Journal editorial by Representative Lamar Smith, one of CauseScience’s favorite anti-science congress members. The short version of highlights below – Read the SciCheck article here for a breakdown and the scientific evidence debunking Smith’s claims. Smith wrote that a connection between worsening storms and climate change has been “widely debunked,” and that the United Nations doesn’t believe that warming is related to “more severe weather disasters.” Both claims are incorrect. There is some evidence linking climate change to worsening hurricanes, droughts and other disasters. He mentioned an oft-repeated claim that there has been a “lack of global warming over the past 15 years.” Though the rate of warming has slowed, the world does indeed continue to warm, and cherry-picked data underlie the claims that warming has stopped. Representative Lamar Smith has been waging a controversial investigation into science that is funded by the NSF and the science review process at NSF. This week, Smith fires back at a recent article in Nature about his investigation. As chairman of the US House Committee on Science, Space, and Technology, I do not believe that you do justice to the committee’s efforts to better understand how the US National Science Foundation (NSF) spends US$7 billion dollars of taxpayers’ money (Nature 519, 138–139; 2015). The NSF is not “caught between the scientists it serves and the lawmakers it answers to”. The money is not the NSF’s or the scientists’: it is the people’s. Congress has a responsibility to ensure that the money is spent wisely and in the national interest. Smith’s weak defense of his witch hunt highlights that taxpayers can’t trust politicians to judge what qualifies as wise spending when it comes to science. And I certainly doubt their ability to judge what science is in the national interest. At a time when many politicians prove their complete lack of understanding of science, or openly ignore, deny, or refute science, how can anyone trust them to judge science in an unbiased, or even semi-educated way???? This is a horrifying turn of events for government funded science. And McDonnell hits the nail on the head with his conclusion. In other words, basic science shouldn’t be judged by how closely it hews to a predetermined, profitable advance. The Large Hadron Collider probably isn’t ever going to do much for the U.S. economy, but that doesn’t mean it’s not in the “national interest” for us to understand the basic physics of the universe. Sometimes, even research on the mechanics of corkscrew-shaped duck penises can be a worthy investment of taxpayer dollars.